Have you ever seen or heard anything about this custom bodied K2? Our build records don't note any K2's being shipped with partial bodywork so we must assume the car was rebodied at some time, likely after an accident. We're going to make a wild assumption that the car was rebodied in the mid to late fifties due to noticeable tail fins and 'continental kit' spare tire mount. If you know anything about this unique K2, please leave a comment or click here to email us. "Back in the early 1950's the "Giant's Despair" hill climb near Wilkes Barre was associated with a road race event for under 2 liter cars at near by "Brynfan Tyddyn". This latter course was a short 3.5 mile road surrounding the lake estate of N Y State Senator T. Newell Wood. 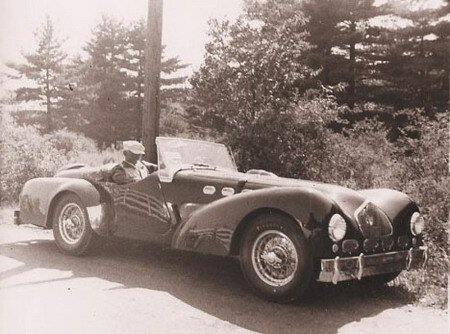 Senator Wood had a very "fancy" red K2 Allard in those days. 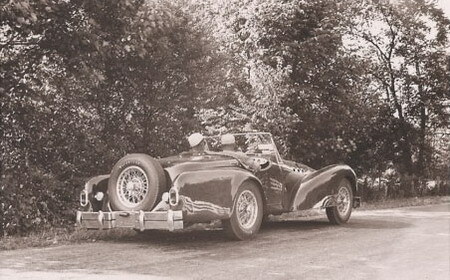 I attended the race as a spectator one year, possibly in 1953 when I ran the hill climb in my new J2X (#3147) or perhaps the summer before, I simply don't recall. I do remember seeing the Senator's car there and was impressed with the shiny wire wheels it had in contrast to the normal ones. I vaguely remember how custom it appeared and I thought at the time it was very garish but, sadly, the details of its exact configuration have totally faded. It definitely could be this car however."